Win £50-worth of TLC Adult Dog Food! Win over £65-worth of TLC Adult Dog Food! 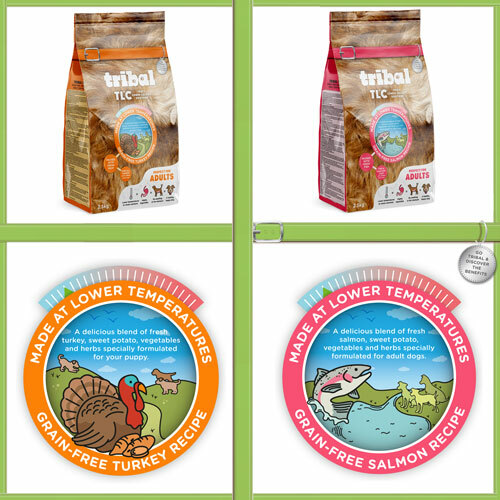 This week we have teamed up with Tribal to give away over £65-worth of their TLC Adult Salmon or Turkey dog food! New Tribal TLC is a grain-free, cold pressed food that is naturally nutritious. When you feed your dog, you want the food to tick all the boxes: appetising, healthy and good value, delivering energy but not excessive calories. While protein is important, it has to be accessible protein – that is suitable for a dog to digest. The Tribal TLC range focuses on turkey and salmon, two excellent sources of protein that can be easily absorbed by the dog’s tummy. Whole egg, sweet potato and salmon oil enrich the food with high-quality fats and minerals and deliver slow release energy. The range also offers a unique combination of supplements, Green Lipped Mussel and Brewer’s Yeast – both of which provide significant benefits to your dog, inside and out. For more information on the full range of Tribal products, visit the Tribal Pet Foods website. You can also find them on Facebook, Twitter and Instagram. This competition closes at 9.00am on Friday April 20, 2018, and is for UK residents only. Good luck!